God Bless Oklahoma's weather roller coaster! In the last few days, we have seen temps as high as 80 degrees...not bad for early February (snow is forecast for tomorrow)! 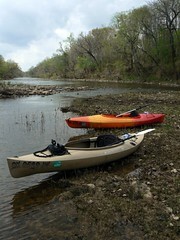 Dianne and I went kayaking at Dripping Springs Lake near Okmulgee on Saturday to celebrate the unexpected fair weather. I hoped we might be able to paddle up on the pair of bald eagles that we have been seeing lately on the lake. When that didn't pan out, I looked for some nice spots to capture the sunset over Dripping Springs Lake. 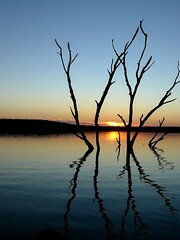 More shots of Dripping Springs Lake here. We like to park near the fishing dock at Clovis Point on the lake. It can be a breathtaking spot to watch the sunset, but this Saturday wasn't really cloudy enough to suit me. As a novice photographer, a really don't know how to stage a compelling picture or how to effectively light a subject. This means that if I want to take beautiful pictures (I do), I have to get out and find something beautiful at just the right time when the light is lovely. It is just difficult enough to be an amusing challenge, but not beyond my capability. I find it to be a nice way to get some exercise that always lifts my spirits. After work on Monday, I managed to squeeze in a couple hours of solo paddling on the Deep Fork River. The easiest, safest Deep Fork River paddling spot that I know is the boat ramp at the Highway 266 Bridge. This boat ramp is the only one I know of on the Deep Fork River. It is brand new area and offers level gravel in the parking area and plenty of deep water for miles upstream and downstream. It has been tougher for me to take cool pictures of the Deep Fork River. Having grown up on this muddy red river, I think I have become too accustomed to her face! Here is a link to some of my Deep Fork River pictures. More Okmulgee, Oklahoma area kayaking spots. Did you manage to squeeze in any paddling during this fine winter weather? Leave us a comment! 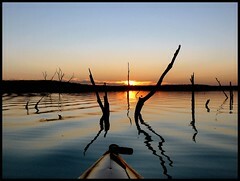 It is time for the 2008 Canoe & Kayak Magazine online paddling photo contest. The categories are whitewater and flatwater. Any type of boat can be used - kayaks, rafts, inflatables, fishing kayaks or canoes. Lots of great prizes are being offered in all categories. For more details visit their webpage. In more good news for local area paddlers, the Wichita City Council in nearby Southern Kansas is also considering an Arkansas River Access Plan that includes about 20 new paddler launches from Hutchinson to the Oklahoma border! The vote is planned for Feb 5th. The first weekend in February looks like a decent one for paddling. I think I may try to get the boats out on Dripping Springs Lake or maybe the Deep Fork River. 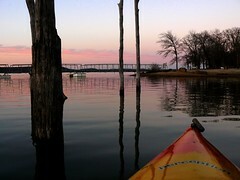 Got a favorite spot for winter kayaking around Oklahoma...leave a comment on the blog and share your knowledge!